Reposted with permission from ideastream.org. To some, the sight of a cemetery invokes fear, and symbolizes death, but not for everyone in the EcoVillage neighborhood, near Fir Street Cemetery on Cleveland's west side. 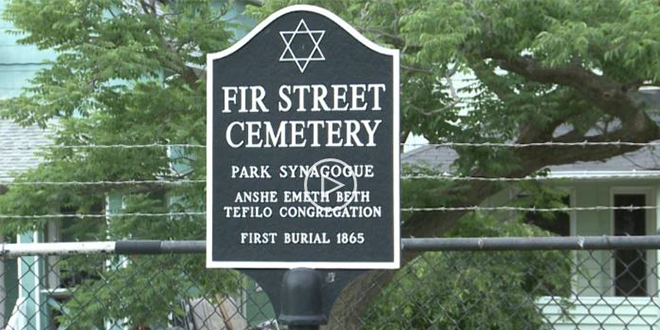 Those residents see Cleveland's second oldest Jewish cemetery as a piece of the city's history worth preserving. Community members of all faiths restored it in 2009, and raised tens of thousands of dollars for future upkeep. Now, the cemetery is set to receive landmark status. Cleveland City Councilman Matt Zone has introduced a resolution for the designation, which he says will likely pass this summer. Jaffe says many of the people buried in the cemetery were immigrants, and their native language wasn’t Europe, and that’s reflected on the headstones. Jaffe says he supports making the cemetery an official Cleveland landmark. “I think that it would be a sign of respect for this cemetery. We’re supportive of it because it would designate on an ongoing basis, and in a public way, the honor we would show to the 850 people buried here,” Jaffe said. The first plot is from 1865, a two-year old boy named Aaron Horwitz. The cemetery remained in active use until 1971, with notable residents like Herman Sampliner, the founder of the B’nai Jeshurun Congregation, Harry “Czar” Bernstein, the owner of Perry Bank and Perry Theatre, and Fanny Jacobs, the founder of Park Synagogue’s sisterhood. But after the last burials in 1971, the cemetery started to fall into disrepair. “Over time, as people transition in and out of Cleveland, and as generations go on, people have forgotten the resting place of their ancestors,” Jaffe said. In 2007, Cleveland Housing Court Judge Raymond Pianka decided to take action and formed a coalition of local residents and members of the Jewish community to raise money to restore and renovate the cemetery. Cleveland City Councilman Matt Zone says the group used the money to redesign the gates and the entrance, plant trees and flowers, and repaired headstones. Councilman Matt Zone was newly elected when he joined the effort to restore the cemetery. He proposed making it an official Cleveland landmark because he says it will be a public declaration that the space matters. Designating the cemetery a historic landmark will ensure its continued preservation and bring attention to the importance of the site. “We want to make sure that people know that rich story, that rich history, and this becomes an asset for our community for future generations to celebrate and enjoy,” Zone said. Zone says he wants to preserve the historical areas of his district, including nearby Gordon Square. Judge Pianka, who was the catalyst for community involvement in the cemetery, died last year, but he sparked an interest in Jewish history on the west side. Adam Rosen, a Jewish man living in the neighborhood, says that means a lot. He says the cemetery is a great way to show Jewish history on the west side of Cleveland. “The ability to have a site on the west side with this much history, over 150 years, is important to that identity and for Jewish Clevelanders to be able to maintain that,” Rosen said. Judge Pianka’s legacy is the preservation of a piece of Cleveland Jewish history. He will live on through his work, much like the history of those buried in the Fir Street Cemetery will continue to live on, for generations to come.